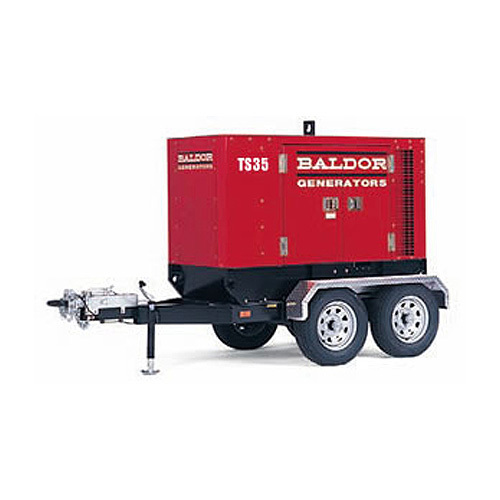 The Baldor TS35T generator is constructed with superior sound attenuation and is very quiet. When combined with a light tower kit, the combination offers a huge benefi t to the rental and construction markets. 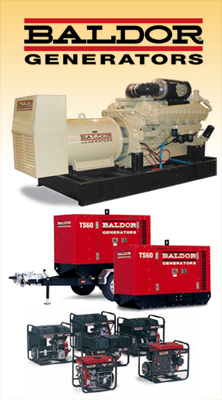 A great match for special events as the generator offers 1 and 3 phase voltage selection with a run time of 36 hours at half load. Another benefi t is its portability. Available with or without the trailer. Voltage Selections – Three-position switch: 120/240 V,1 phase connection; 120/208V, 3 ph connection and 277/480V, 3 ph connection. Large Integral Fuel Tank – Stays with the unit eliminating messy interconnections between unit and trailer. Fuel Water Separators – Protects the engine from water and other contaminants. Cold Weather Starting – Provides ease of starting in cold weather.